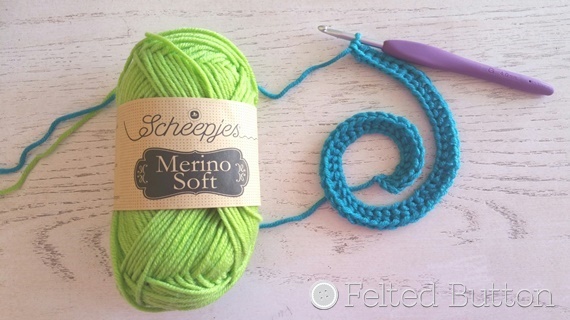 When the opportunity arose to use Scheepjes *Merino Soft for a Design Wars Challenge, I jumped at the chance! And why is that, you ask? The COLORS! 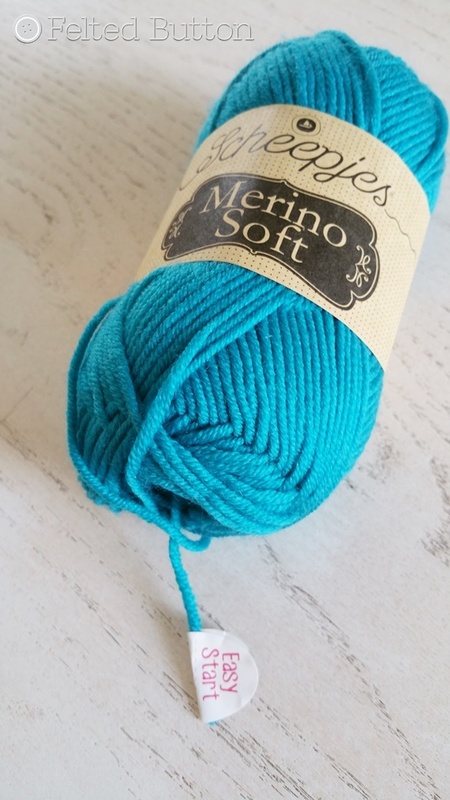 With 54 colors to choose from in the Merino Soft line, I was struggling to narrow down my color selection and finally managed to settle on “only” 22. The colors are rich, vibrant, on trend, and make me seriously happy. So you might ask if it is really as soft as the name states. Merino Soft is exactly that—SOFT. It has a delightfully scrumptious hand and fabulous drape. This yarn is 50% merino wool, 25% microfiber and 25% acrylic. And according to the laundry label it is machine washable which makes it an excellent choice for almost every project. Because it is so gentle on the skin, it is perfect for cowls, scarves, clothing and, yes, blankets! Now want to see some brilliance in action? That little easy start tab means no digging around in the center of the skein for the end. And it pulled cleanly for me on every skein. Brilliant, I tell ya! Because the yarn is not tightly plied, I thought I might have trouble with splitting. But with my Clover Amour hook I had not a bit of trouble, but would be curious if other hooks had different results. So do you want to see what I made with this heavenly yarn? I'm calling it Chromatic Cobbles Blanket because it reminds me of a VERY colorful cobblestoned street. In typical Felted Button style, I designed a blanket with loads of texture and a chromatic flow of rainbow hues. It can be made to any size you wish, too. 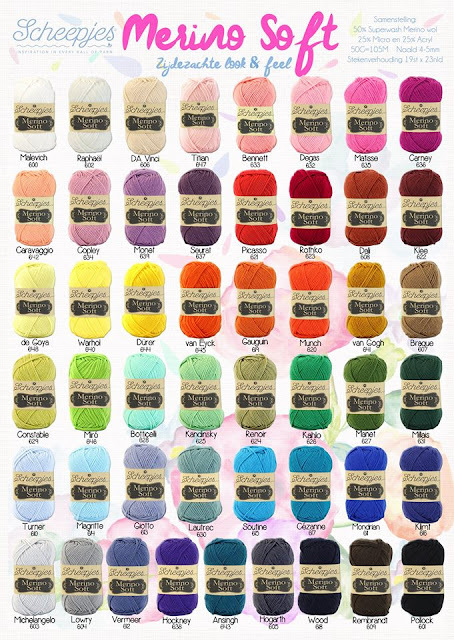 Since I only used half of the 50g skeins of each of the colors with exception to the border color--of which I used nearly 3 entire skeins—you could increase the size of the sample blanket by 50% by only ordering extra of the border color. I’m pretty tickled about the colorplay, texture and uniqueness of this blanket. But I especially like how squishy it is because of the added strips of color. The strips are quick and simple to make and weave. Grab a skein and head out with your hook for some on-the-go crocheting of strips, too. For this Design Wars Challenge, I'm a contestant along with the talented Kirsten of Haak Maar Raak--you really must subscribe to her blog. If you don't follow Design Wars, as well, I suggest doing so on their Facebook page here and blog here. Today only is voting day for the challenge so hurry and click HERE to vote for your favorite. The pattern is available right now for purchase on Ravelry here, Etsy here, or Craftsy here. If you use the coupon code DWSALE at checkout on Ravelry only, you can get 30% off all patterns in my store through January 23 (PST). Thanks for joining along on this crazy crochet adventure of mine! I sincerely appreciate you and your kind support. This is so much fun! | On the Board | -- God didn't design us to be sad. He created us to have JOY! *This post contains affiliate links marked by an asterisk. Thank you for your support. That blanket is absolutely gorgeous. I think the yarn would be nice to work with but I haven't tried it yet. Love the easy start tab. Thank you, Gillian. The yarn is really nice to work with--and, yes, the tab is so smart! Gorgeous colours....and I love the ribbed effect. That is going to be a popular pattern!!! Thank you, Amanda! It has a great texture--and squishiness. I certainly hope it is popular. THis response makes me happy, because that's one thing I hope my designing does--bring JOY! Thanks for your comment. Your design is so amazing looking! Thanks, Casey! I'm pretty tickled with it, too! Superb! You are a genius with color and texture! I just love the wonderful designs you come up with. Wish I could be a fly on the wall during your design process :) Thank you for the lovely message on the board. Have a nice day. Love. Thank you, Sangeetha. You are always so kind. Why don't you come visit here in the States?! We would have such fun! What a stunning blanket! I love the colors you chose and I especially love the pattern! Thank you for your kind comment. I love the colors, too! That's so funny because my brain thinks color. I looked up the definition as I was naming this design and learned about the musical meaning. Crazy, I tell ya! Thank you so much for your pattern purchase and kind words. I hope you enjoy them! I love this pattern. I can't seem to find a source for this yarn in the USA. Am I missing something or is it only available in Europe? Good question. They don't have a source in the US yet, but hopefully they will. You can buy from Deramores.com and they ship free if the order is over $50. It always comes speedy quick, too.